I like to read the Bible every day. In talking about this, I like to think of it as, “No read, no feed.” This means, if I am unwilling to read the Bible, I should also be unwilling to put food in my mouth. Let me share a bit about why I read the Bible every day and a little bit about my “no read, no feed” policy. Here are a few reasons why I do this. First, I am not dogmatic about my policy. I want to be sure I don’t cause any confusion or lay out a personal preference as a prescription for others. Of course, there are days where I have eaten and not read my Bible. It is a policy, not a law. I can say that the majority of the time I adhere to “no read, no feed,” but again, it is not an “absolute must do” rule in my life. I look at it more as a really good idea. Some people prefer to read the Bible in the afternoons or evenings. Mornings just happen to work best for me. I like how in Psalm 103, David instructs his body to praise the Lord. He says, “Bless the Lord, O my soul, and all that is within me, bless His holy name.” I want my flesh, all that is within me, my body, to know the importance of blessing the Lord. My spiritual food for my soul is infinitely more important than food for my physical body. So, it is a daily reminder for me to have the right priorities. Man shall not live by bread alone, but by every word that comes from the mouth of God. Psalm 1 instructs us a man will be blessed when he meditates on the law of the Lord. Why would I not want to be blessed? I find joy in having “fresh meditation material” to dwell on throughout the day. I don’t believe my reading the Bible every day makes me any more spiritual than anybody else nor do I believe it is gaining me any favor at all with God. I read the Bible every day because I truly believe it is good for me to do so, just like eating food is for my good. God has called me (all of us, actually) to know and study His word. 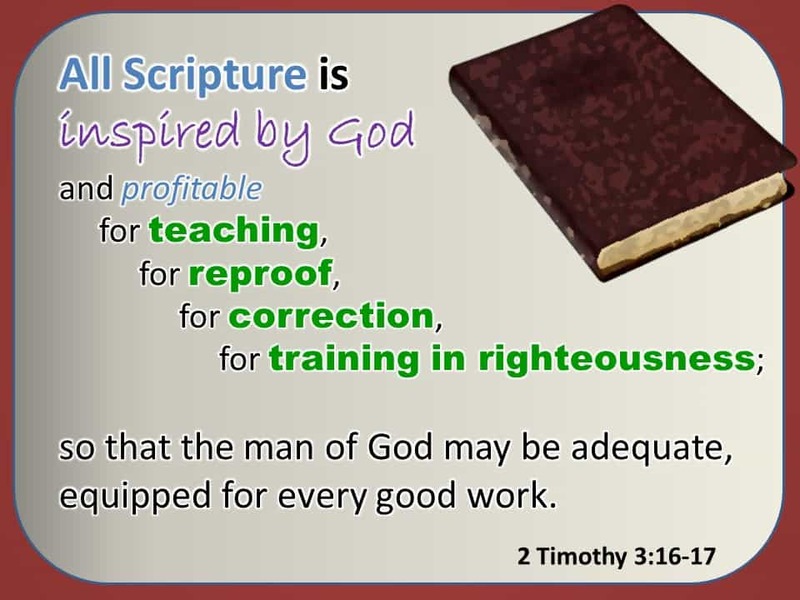 “Study to show thyself approved unto God.” It is a command, not a suggestion. The Apostle Paul prays that the churches would grow in the knowledge of God’s will. There is only one place I can find the knowledge of God’s will and that is the Bible. Having an ever increasing understanding and knowledge of God’s word helps me to “not be conformed to this world, but to be transformed by the renewing of my mind.” Each day I am going to be bombarded by the media. The radio and internet, and the very presence of this world’s culture in the marketplace are vying to influence me. Whether it is politics, products, or philosophy, the continual message of the world is contrary to God’s worldview. By choosing to read the Bible daily, I am counteracting the continual effect this world has on my thinking, my worldview. God has divinely chosen a “book” to communicate His specific revelation. In the Bible, I find the truth, comfort, peace, joy, life, understanding, and so on. It is the only place I find satisfactory answers to life’s most difficult questions. Why wouldn’t I want to read the Bible consistently? We all are engaged in a battle against sin. Psalm 119 verse 11 says, “Your word I have treasured in my heart, that I may not sin against You.” The Apostle Paul instructed the Corinthians, “For though we walk in the flesh, we do not war according to the flesh, for the weapons of our warfare are not of the flesh, but divinely powerful for the destruction of fortresses. We are destroying speculations, and every lofty thing raised up against the knowledge of God, and we are taking every thought captive to the obedience of Christ …” (2 Corinthians 10:3-5). The primary battle against sin is battling the sin of unbelief. I fight unbelief by filling my mind with the knowledge of God (His mighty works, His character, His love, His goodness). The more I know and learn about God the more I will love Him. The more I love Him, the more I will hate my sin that separates me from Him. There is a direct correlation between sin and knowledge of God. Reading the Bible is very helpful in my fight against sin. When reading the Bible, my faith grows stronger. Faith comes by the Word of God. Faith is the opposite of unbelief. I enjoy following a “through the Bible in one year program.” I enjoy completing it every year. Most years, I am reading the Bible chronologically. Some years, I focus on getting deep into a section (smalle amount or reading, but with much more concentration). I enjoy the “Chronological” plan. It is compiled according to historical research, taking into account the order in which the recorded events occurred. Where else may I turn? As Peter told Jesus, “Lord, to whom shall we go? You have words of eternal life.” My reading of the Bible is beneficial; I believe they hold the words to eternal life; the very pathway to God. I hope this encourages you to enjoy the Bible every day.